If you have an InfoSWMM 2D license and you have set up your model with all of the necessary 2D elements and parameters, you can enable the 2D Simulation option. You must also set the 2D simulation options to fit the needs of your modeling scenario. 2D Timestep Multiplier The 2D timestep should be a multiple (i.e. 1, 2, 3 etc.) of the routing timestep specified in Time Step Options. 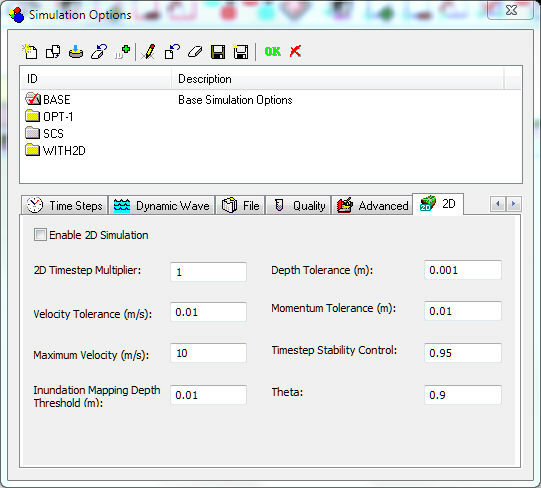 The calculations used by the 2D simulation are partially explicit and they are therefore influenced by the simulation time step. The recommended timestep will vary according to the size of the mesh. For relatively large meshes, a timestep of 20 – 30 seconds would be appropriate, but for smaller meshes, 5 seconds or even less should be used. The results should be checked for mass balance errors and if necessary the timestep reduced. Velocity Tolerance Mesh elements with water velocity below this value will have velocity reset to zero in terms of momentum calculations. Maximum Velocity Velocity threshold limiting the velocities that can be achieved in an element in a 2D simulation. Mesh elements with water velocity above this value will have velocity reset to the maximum specified. Inundation Mapping Depth Threshold Depth threshold used to determine Time to first inundation for mesh elements. Time to first inundation is reported as the time (from the start of the simulation) at which water depth in the mesh element first exceeds this threshold. Momentum Tolerance Depth threshold used to determine whether to consider momentum in a mesh element or not. Movement of water will not be calculated for mesh elements with depth of water below this value; only mass conservation will be taken into account. On the partial Difference Equations of Mathematical Physics. Math. Ann., Vol 100, p32. condition). Theta Weighting factor, θ, for the semi-implicit parameter. Weights the explicit and semi-implicit parts of the numerical scheme used for the time integration of the flow equations. The higher the value, the more weight given to the implicit part.